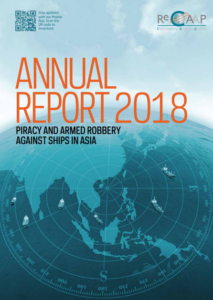 ReCAAP ISC published its annual report 'Piracy and armed robbery against ships in Asia', addressing that piracy and armed robbery have experienced a decrease by 25%. Additionally, the number of actual incidents showed a reduction of 31%. To this result, the number of incidents remains at a low level, in comparison to previous years. 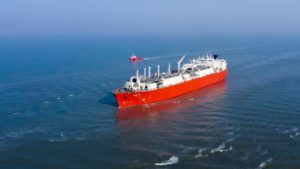 There was no actual incident of hijacking of ships for oil cargo theft in 2018. Yet, despite the improvement, ReCAAP ISC highlights the need of law enforcement agencies to continue their efficient operations. 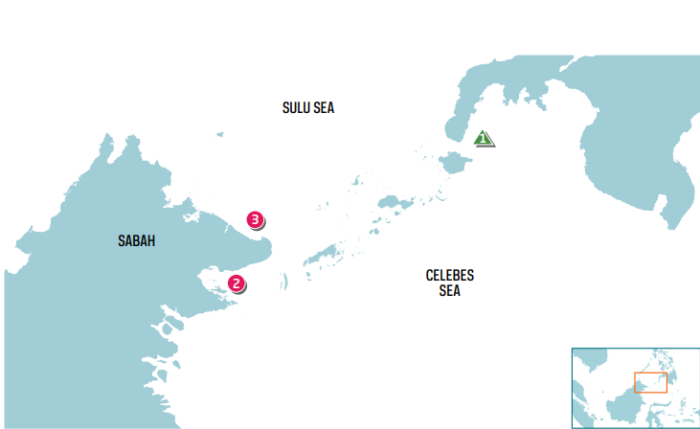 Of the 76 incidents, 4 were incidents of piracy, while 72 were armed robbery against ships. Malaysia (Pulau Tinggi, Sarawak, and off Tambisan, Sabah). 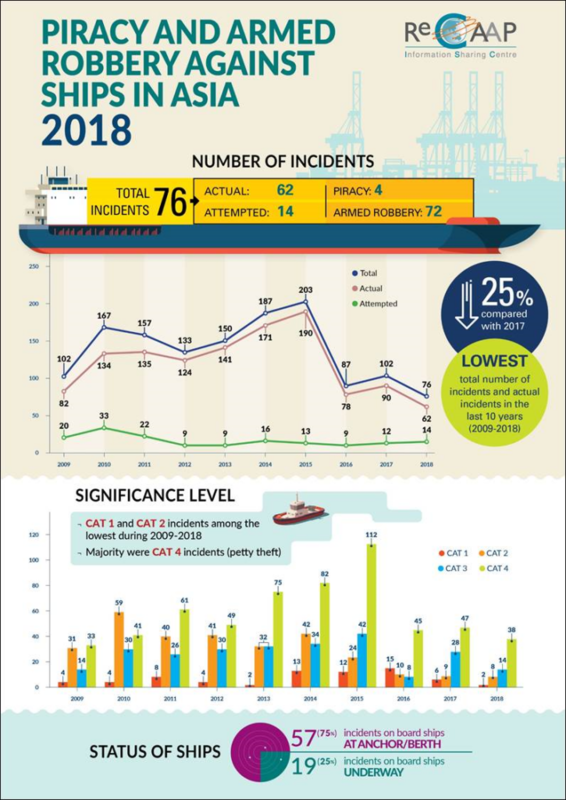 3 incidents, 2 actual and 1 attempted, of abduction of crew were reported in 2018 compared to 7 incidents, 3 actual and 4 attempted in 2017. 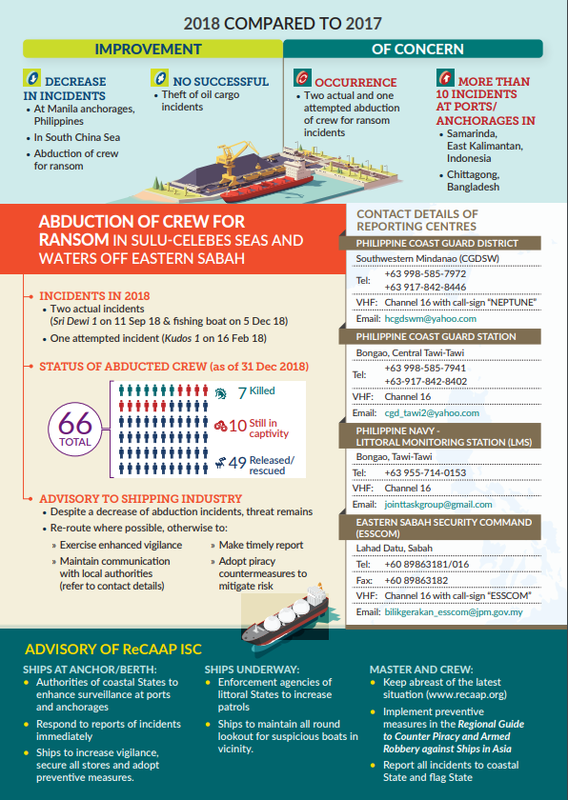 Additionally, ReCAAP ISC, over the past 12 years has collected the data of 1.560 piracy and armed robbery incidents in Asia and resulted to some characteristics of the incidents, concerning the number of perpetrators, the weapons used, treatment of crew, items stolen, the types of ships boarded, and time of incidents reported in Asia. Concluding, Masafumi Kuroki, Executive Director of ReCAAP ISC stated that ReCCAP urges law enforcement authorities to keep on their attempts and cooperation to decrease these kind of incidents.